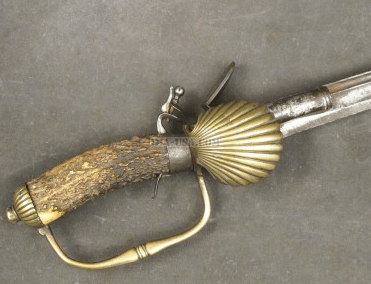 A GOOD AMERICAN-MADE REVOLUTIONARY WAR PERIOD SOLDIER’S CUTTOE, ca. 1770: Blacksmith made, slightly crude, 19 1/2″, single-edge blade with a dark, untouched patina. Good+ steel surfaces with a sharp cutting-edge and some scattered patches of light pitting and discoloration. Simply carved, American-made, hardwood grip with an old stress-crack and plain, light-colored, wooden surfaces. Simple ring-type “pommel” with a very good tang-peen. Made without or possibly lacking its cross-guard. In overall good+ untouched condition. The blade with generally smooth, untouched, dark surfaces and a sharp cutting-edge. The grip with sharp contours and a fine age patina: some minor wear and the noted crack. 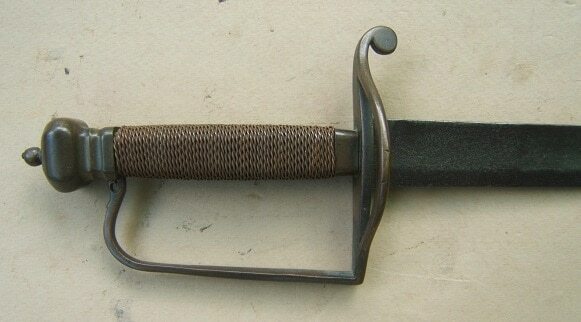 A very nice example of an American Blacksmith-made Revolutionary War Period Soldier’s “Hunting Sword/Cuttoe”. Overall length, 25″. For similar examples please see G. C. Neumann’s “Swords & Blades of the American Revolution”.